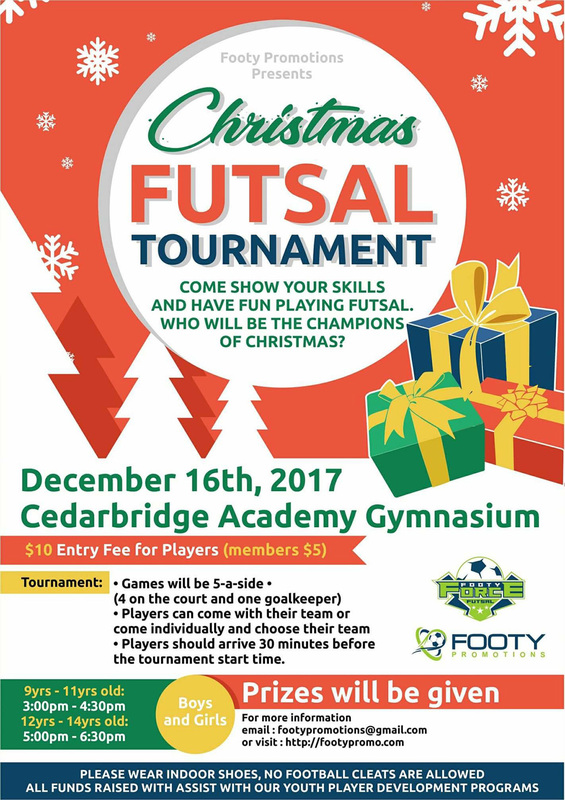 Footy Promotions will be hosting a Christmas Futsal youth tournament on Saturday December 16th, 2017 at the CedarBridge Academy Gymnasium. The tournament will start at 3:00pm for players between 9 – 11 years old. Then, immediately following, players 12 – 14 years old will start at 5:00pm. Both boys and girls are welcome to participate. A spokesperson said, “We are excited to host another Christmas Futsal tournament. Players have been playing futsal all year and it is a great platform for them to showcase their skills. We anticipate another fun atmosphere with thrilling futsal games. For more information please contact footypromotions@gmail.com.